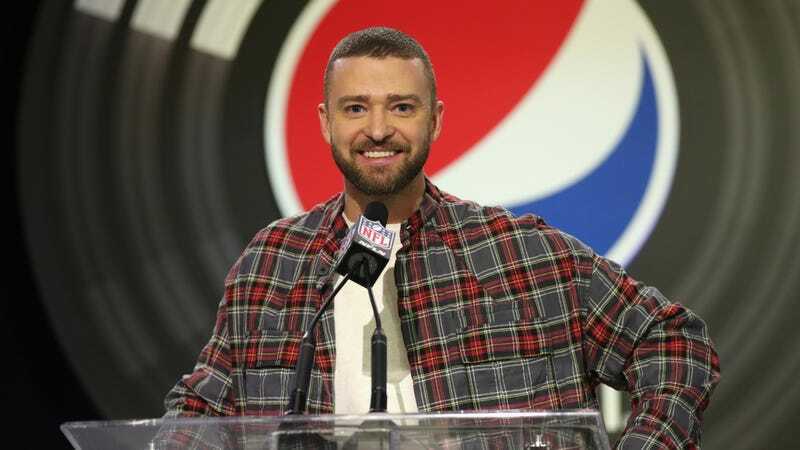 Today, man of the woods Justin Timberlake returned to civilization for a press conference about his upcoming Super Bowl Halftime Show performance, taking a moment to shoot down everyone’s hopes for any special guests he might be bringing along to Minneapolis. As reported by Reuters, Timberlake said that he had “a ton of grand ideas” about who he could bring in for a surprise appearance, including his old ‘N Sync buddies, recent collaborator Chris Stapleton, and Janet Jackson, but it sounds like none of them made the cut. Instead, he has decided that his backing band, the Tennessee Kids, are all that he needs. “I feel like they are my special guests,” he said, adding that he’s excited to “rock the stage” with them. An ‘N Sync reunion certainly would’ve been fun, but it’s Janet Jackson’s missing invite that stings the most. After all, he did basically ruin her career during the 2004 Super Bowl Halftime Show when he ripped off a part of her dress and caused a “wardrobe malfunction.” Jackson took most of the blame, while Timberlake has just gone on to become more and more famous. The whole “incident” shouldn’t have been such a big deal in the first place, but it would’ve been cool of Timberlake to make amends by letting her rock the stage with him and the Tennessee Kids. Unless, of course, he’s totally lying and his show on Sunday will actually feature ‘N Sync and Janet Jackson.